Save Up to 90% Off Hot Brand Items at Bradsdeals! 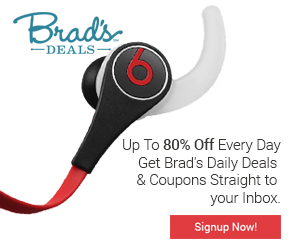 Sign up for free and receive daily emails with every day discounts of up to 50 to 90% off the Best Brands at the Best Stores through Bradsdeals! Save up to 90% With Daily Deals Sent to Your Email Through Your Best Deals! 3000 Nail Art Gems and Rhinestones Only $1.96 Shipped! SODIAL- 3000 Nail Art Gems Mixed Colours Shapes in Case (Size 2mm) – Only $1.96 Shipped!! 3000 PCS Nail Art Rhinestones in various sizes and shapes. They are reusable if you are careful when taking them off. You can use it for nail art or decoration of mobile phone, ipod etc. You can also use them to decorate cards, clothing, handbags, jewelry, shoes and more. Colors shown may vary from photo. FREE Grocery Store Coupons From Cellfire! Cellfire is a market innovator for digital save-to-card coupons plus promotions. Sign up for digital grocery coupons from top retailers. Never clip a coupon again. With Cellfire you can save online grocery coupons directly to your supermarket savings card. No clipping, no printing, no forgetting! Save hundreds of dollars on your groceries with Cellfire’s free paperless coupons. Click Here to get started! Living Social Offers an Extra 25% Off of Deals For Father’s Day! Sign up here for free & be sure to never miss a daily deal again! With unique and diverse offerings each day, we inspire members to discover everything from weekend excursions to one-of-a kind events and experiences to exclusive gourmet dinners to family aquarium outings and more. Click here to be updated on huge savings in your area! Save an extra 25% on LivingSocial deals using “FATHERSDAY” promo code! Terms and Conditions Apply. Daily Deals in Your Neighborhood – Save up to 70% off! View Deals for FREE! Deals is DailyCandy’s way of helping our readers get the most out of their city. They offer up to 70% off unique Deals so you can get out and shop, eat, and see, all without breaking the bank. Click here to see the HOT daily deal in your area! Super Deals at 1 Sale A Day! 1SaleADay offers one deal per day in each of their five categories: Main, Wireless, Watch, Family, and Jewelry. Each deal is posted at midnight EST, and is only available for 24 hours, so hurry and buy them before today’s products are replaced by tomorrow’s! Get name brand products, up to 97% off MSRP! See today’s deals at 1SaleADay.com!